Sold under the brand name Nutrela, soya chunks are a high-protein meat substitute. 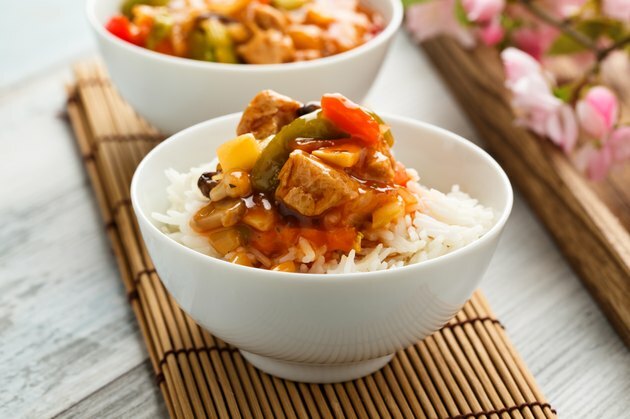 Soya chunks are derived from soy flour, according to food-interest website Sunshine and Smile, and are technically classified as a textured-vegetable protein. Nutrela sells the produce as packaged chunks or nuggets around the world. The most popular recipes for preparing Nutrela find it as part of a curry, a spicy saute or deep-fried as a patty, like falafel. Submerge the soya chunks in a bowl of boiling water. Soak them for 30 minutes, until they are soft, and then drain them. Press the chunks between your hands to squeeze out any retained water, and then set them aside. Combine the ginger, garlic, bell pepper, chili peppers and mint in a food processor and pulse until the mixture is well chopped. Set it aside. Heat vegetable oil in a medium skillet over medium-high heat for 1 minute. Add the sliced onions and cook them for 2 to 3 minutes. Add the ginger mix to the pan and cook until it is fragrant, 2 to 3 minutes. Mix in the tomatoes and saute them four to five minutes. Sprinkle the pan with masala and turmeric and add Nutrela chunks. Stir to coat the Nutrela and mix it with other ingredients. Pour in at least 1, but up to 2, cups of water depending on how thick you want your curry. Simmer the curry for 10 minutes. Season with salt to taste and top the curry with chopped cilantro leaves. Remove the curry from heat and serve it. Heat 2 tbsp. of vegetable oil in a medium skillet over medium heat for one to 2 minutes. Add garlic-ginger paste and chili peppers to the pan and saute for 2 minutes. Stir in onions, salt and pepper and cook the onions for 4 to 5 minutes, until they are translucent. Add the tomatoes and soya sauce and cook the mixture for 2 minutes. Add bell pepper and chili paste to the pan and cook for 2 minutes. Toss the Nutrela with the pan's other ingredients. Add hot water and saute until the water is absorbed, 5 to 10 minutes. Sprinkle the soya chunks with additional salt if desired and serve them hot. Heat water in a medium saucepan. When it boils, add the carrots, onions, green beans, peas and corn kernels, and cook the medley for 5 to 7 minutes. Drain and set the mixture aside. Combine the vegetables, Nutrela and mashed potatoes in a mixing bowl with ginger-garlic paste, chili peppers, cilantro paste, chili, turmeric, garam masala powder and black pepper. Blend the mixture with a large wooden spoon and use your hands if the ingredients are too difficult to mix. Form a small ball, no more than 1 inch in diameter, from the Nutrela-and-vegetable mix with your hands. Dredge the ball in a bowl of bread crumbs and pack it with your hands. Flatten the ball and set it aside. Repeat until the Nutrela-and-vegetable mix is exhausted. Heat vegetable oil over medium-high heat in a skillet until it is hot. Reduce the burner to medium and fry the patty until the underside is browned, 3 to 4 minutes. Turn the patty and cook it for an additional 2 to 3 minutes. Remove the Nutrela patty and set it on paper towels. Repeat until all of the Nutrela patties are cooked. Be careful when working with hot chili peppers and ground chili paste. The oils in the peppers and fumes from the chili paste can irritate your skin or the mucous membranes in your nose. How do I Make Burgers on a George Foreman Grill?